Food: Where Did We Go Wrong? I enjoy eating. I think most humans do. It’s exciting to try new foods. My husband encouraged me to try an oyster about a month ago and I did. It wasn’t anything I would eat again but I tried it! Food is great. It sustains us, it gives us nourishment, it satisfies us and especially when we are younger, it helps to keep us growing. But food is not what it once was. Food is no longer grown the same. It’s not harvested the same and it’s definitely not packaged, cooked and served the same. Did you read about China recently selling 40-year-old meat? This is not a joke. Click here to read this New York Times article. I mean…what? I can’t even wrap my head around that. Everywhere you turn something that was good for you no longer isn’t, everything will kill you and unless you farm all of your own animals, crops and herbs, everything is infected with hormones and pesticides. The Pompeo bill, aptly dubbed the DARK (Deny Americans the Right to Know) Act, will take away the right of states to require GMO labeling and will legalize the routine industry practice of labeling genetically engineered (GE) foods as ‘natural’ or ‘all natural.’ It also includes a complicated scheme for voluntary labeling of non-GMO foods. Here’s a great article to learn more about the Pompeo bill and how we can stop it. My concern is where did we go wrong? 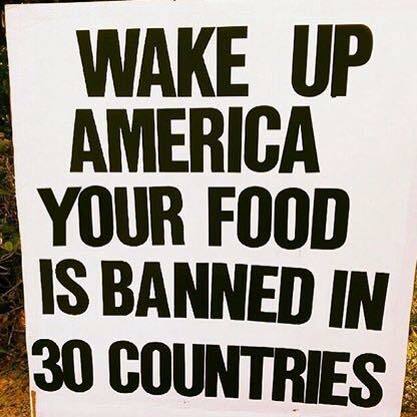 Why is it okay to have foods and ingredients banned in other countries but allowed here in the United States? Eating healthy is expensive and it shouldn’t be. We shouldn’t have to pay double for organic when years ago that’s all there was. Our food should be labeled properly, especially those with GMOs. No more ‘natural flavors’ or ‘all natural’ crap that allow companies to put whatever they want in these foods and cover it up with these blanketed terms. The highest expense in our household is food. We rarely eat processed foods and buy all organic minus the things you can get away without buying organic like bananas or avocados. We spend a lot of money and I’m sick of it! Where is the FDA? Oh yeah, they’re hiding behind Monsanto! For our year anniversary, my husband and I traveled to Europe, specifically Paris and Italy. I have never eaten more amazing foods. I will never forget that trip. When we returned home to American food we were extremely sick. There’s just something different about the way other countries grow and harvest their food. It’s not about cutting corners, how many chickens we can stuff and cage in one confined area and the quickest way to produce the most. I am thoroughly disgusted by America’s food, I really am. I hope something changes and I hope it changes fast. I know activists like Food Babe are making this their mission and I applaud them. I am also grateful for them and their crusade as they slowly but surely are making these changes happen! The best way you can take a stand is to educate yourself. Do your research, sign petitions when you can and be very careful when grocery shopping. I pray for a better food future, I really do.